My six-year-old daughter had accumulated a couple of Toys-R-Us gift cards. We found them by accident one day while cleaning out her room (but that’s another story). Anyway, we jumped online and ordered the equivalent of $50 in merchandise, which was to arrive between 5-7 business days. I quickly moved on to other things. Here’s how my daughter heard my sincere, accurate and completely pointless explanation. Why was it pointless? Because she didn’t care. Even at age 6, she understands that next-day, even same-day, delivery is possible – and, of course, preferable. She wanted it now. Brands collectively spend millions researching consumer expectations for delivery speed. If you’re one of those brands, let me save you some money. The next generation of buyers wants it now. 7 days is not now. 2 days is not now. Is Delivery Speed a New Addiction? “Speed” was once a popular street term for addictive, amphetamine drugs. Today, speed relates to a different kind of addiction. Shoppers get their “fix” not when they buy, but when they receive items. It’s why 66% of respondents in Metapack’s State of eCommerce Delivery Report said they bought from one retailer over another because of more and faster delivery choices. 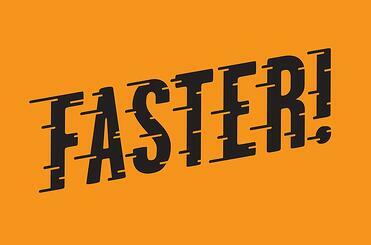 The message for brands developing a supply chain strategy: it’s good to be fast. There is actually some psychology behind this human desire for instant gratification on purchases. Studies suggest that, after we pay for something, we have an immediate sense of ownership and entitlement. It’s mine and I want it. A purchase at a brick and mortar store brings that instant gratification. An online purchase puts us in an impatient, uncomfortable state of waiting – a state we want to eliminate. Narayanan Janakiraman of the University of Texas/Arlington observed that people will spend 6 months deciding what SmartPhone to purchase, but once they actually buy it they will pay $35 extra for next-day delivery. Fascinating. And 100 percent accurate. The critical importance of supply chain speed is not just an eCommerce imperative. It applies broadly across the retail supply chain. One important note on supply chain speed: It’s not achieved by REACTING faster, it’s achieved by analyzing data and PREDICTING inventory and transportation needs. The company that waits for the order and reacts quickly will still be eating the dust of the company that knows the order is coming and plans. In this environment, faster, smarter computers and experienced analysts are critically important complements to quick-turn warehouses and efficient truck networks. 3PLs like KANE are adapting to the need for speed-driven supply chains and positioning themselves to help brands compete. We continue to expand a physical distribution infrastructure to put products closer to buyers for rapid delivery – an area where most brands and retailers (particularly mid-tier companies) fall far behind Amazon’s capability. We’ve built the information infrastructure to promote real-time data exchange and collaboration across supply chain partners. The need for speed in supply chains is clear. Buyers of all types are getting less patient – whether it’s a manufacturer needing raw materials or a convenience store needing potato chips or a six-year-old waiting for her games of Candyland and Connect 4. The question from each will be the same: “Where’s my stuff?” It’s our job to respond with a supply chain strategy that’s in sync with 21st-century service expectations.